HiTemp Technology LLC (HTT) offers the industry's only FIVE-YEAR LIMITED WARRANTY on High-Efficiency Thermal and Low-Temp Catalytic Oxidizer Systems. HTT FIVE-YEAR LIMITED WARRANTY allows our clients to be confident about the dependability of their system. 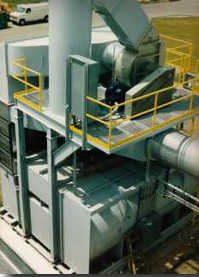 HTT offers 100 to 50,000 SCFM systems with destruction efficiencies over ninety-nine (>99%) percent. Our proprietary, Low-Temp Catalyst is able to operate at 400 to 500oF. At this temperature, the operating costs are lower than RTO systems. Substantially lower initial cost and faster delivery makes a HiTemp system a much more attractive solution to meeting your environmental requirements. If you have VOC emissions challenges, we can help you quickly solve them in the most cost-effective way possible. Why call HiTemp Technology LLC?